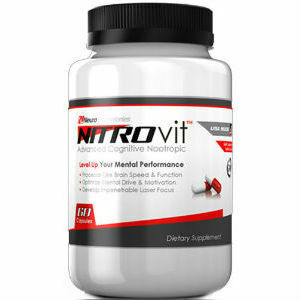 Welcome to our in-depth review of a supplement called Nitrovit, manufactured by Neuro Laboratories. The producer claims that this supplement is supposed to help people struggling with lack of motivation and focus, while boosting productivity and memory. The product is advertised as a means to increase motivation and improve sleep quality, as well as control ADD or ADHD associated symptoms. Keep on reading to find out our opinion about this remedy. People with dietary restrictions should make note of the fact that one of the inactive ingredients of this product is gelatin. After thorough research, we managed to find out that the recommended dosage for this product is of two capsules a day. The manufacturer also states that this dose can be increased to three or even four capsules a day but strongly recommends against exceeding the four capsules a day dosage. One bottle of Nitrovit which contains 60 capsules costs $58.97. This price is quite high, because even though the manufacturer claims one bottle is a month supply of the product, the label clearly states that the dosage can be increased up to four capsules a day. In other words, customers who have chosen to increase the dosage are not in for a great deal. This product does come with a two month money back guarantee. Unsatisfied customers need to return the bottles to get a full refund. However, the manufacturer only accepts returns when it comes to unsealed bottles, which is somewhat concerning, especially since they also have multi bottles packages that would prove to be a bad investment in case a customer needs to return something. All in all, this dietary supplement could be a useful remedy for people who suffer from lack of focus and motivation. It has various ingredients in appropriate concentrations and it comes with quite a strong guarantee. However, the fact that the guarantee only applies to unsealed bottles is somewhat concerning, not to mention the fact that when compared to other similar products, Nitrovit proved to be pretty expensive. Add that to the fact that the capsules are not exclusively vegetarian and you might want to keep looking. Henry Costa	reviewed Nitrovit	on November 15th	 and gave it a rating of 3.